WASHINGTON (CNS) — Miguel Servellon remembers that his mother’s prayers during difficult times of war in his native El Salvador included the phrase “life always has color,” words of comfort she used to transmit to her children the message that there is always beauty in the world even when times are hard. 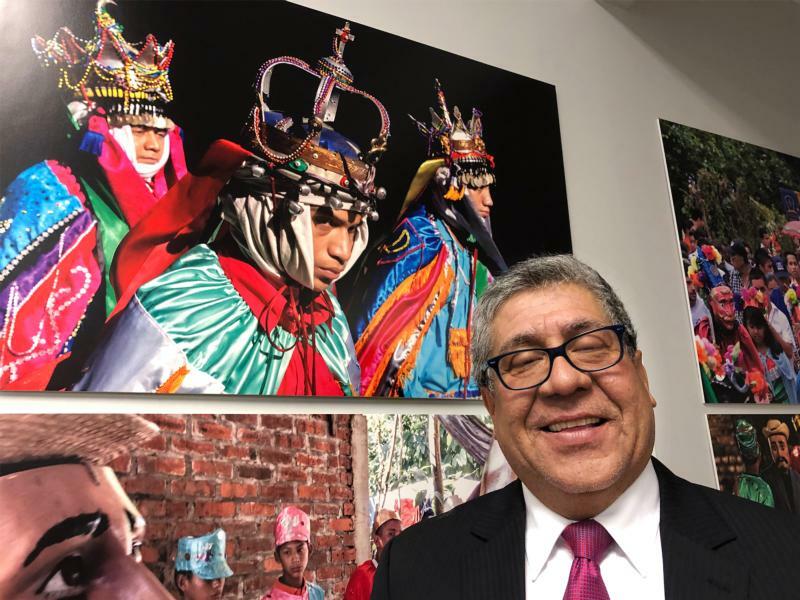 Now at 53, Servellon transmits that message of hope through his photographs, which includes a series on display at the Embassy of El Salvador in Washington unveiled Nov. 30 during an event celebrating Salvadorans living abroad. The series of 25 photographs in the “El Salvador: Traditions and Identity” exhibit focuses on indigenous towns and cities in the Central American nation, capturing part of their spiritual life, which includes in large part Catholicism. It was difficult to carry on with a meeting in the room where the exhibition had just been set up because the color of the photographs kept grabbing away the attention of those gathered there, said Claudia Canjura, the Ambassador of El Salvador, during a reception introducing Servellon and the exhibit’s curator, Jesus Romeo Galdamez, Nov. 30. After the war that lasted officially from 1980 until 1992, El Salvador has struggled to become a nation at peace. Gang members deported from U.S. prisons gained a foothold in the Central American country in the 1990s and have terrorized the Salvadoran citizenry, particularly the poor, for decades. In turn, many Salvadorans have left for places such as the U.S., seeking safety and better economic conditions. Some ended up in places such as the Washington metropolitan area, home to some 200,000 Salvadorans — one of the largest concentrations in the United States. “El Salvador is not just violence, delinquency. El Salvador is history, El Salvador is color, El Salvador is art, music, dance, traditions and customs,” Servellon said to the group of Salvadoran expats gathered in the room. “These are traditions and customs that remain in spite of the violence, in spite of the war, in spite of all the vicissitudes that El Salvador has lived through. It has been a strong country, it has been a proud country,” said Servellon. Like the indigenous people in the photographs — populations dispossessed of their riches, decimated during and after the Spanish conquest, and later abandoned — El Salvador is a country where beauty is still present even during hardship, said Servellon, a former seminarian who said his Catholic education at Salesian schools influenced his desire to deliver a message of conscience and optimism through his art. He depicts in them the young and the old, the pagan and the Catholic side of indigenous towns that suffered under the Spanish crown and whose resources also were plundered in recent centuries by politicians and economic systems that all but decimated native populations. And yet, those populations are still standing and celebrating their beauty via the color of native outfits and by manifesting the mix of the spirituality of their indigenous ancestors with the “imposed” Christian faith, Servellon said. The mix shown in the spiritual life of Salvadorans is a main component of identity and it’s important to understand those roots, Galdamez, the curator, said. The exposition can help the “Salvadoran universe,” such as the one that exists in places where there are large concentrations of Salvadorans and their descendants, like Washington, conserve and strengthen the ethnic roots that mark Salvadoran culture, Galdamez said. Only by understanding that past can the country and its people put present struggles in perspective, Servellon said. “I remind you that El Salvador is a great country, one that has struggled, fallen, but one that has risen again,” he said. The photographs aren’t just meant to show something “decorative,” Servellon said, but to show beauty and hope that will perhaps inspire solidarity among Salvadorans throughout the world.